Hello BizWebs entrepreneur, top must-read questions we answered over the January are here. Find at least one idea that makes your work easier. Deleted pages, domain registration, SEO help and much more... Happily, sip your favorite coffee while reading our news. We do our best and all the hard work for you. Q: Hello, I deleted my Terms and conditions and FAQ section yesterday. Is is possible to search pages in a system or just do something to take it back? I worked a lot with these. A: Hello John, your deleted FAQ website should be available on the address https://topcars.bizwebs.com/faq. If you deleted website permanently, only one option is to restore the whole website from your backup. A backup of the site is created every day between 02:00-06:00. So If we restore your data from yesterday, all the data created today will be deleted, as the last backup was between time mentioned above. Would you like to restore your files from yesterday backup? A: Thank you Mr. Cat for your order. 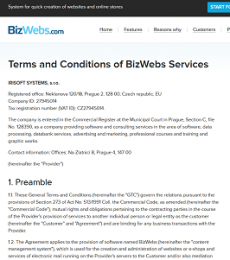 I created a proforma invoice for registering your new domain www.dogger.eu. The system will send an invoice to your email address during the day. After payment confirmation, we will register and set up your new domain www.dogger.eu as the main domain and the original www.dogger.bizwebs.com is going to be a secondary domain, redirecting to www.dogger.eu. In a case you have questions, please contact us. Q: Hello, please, could you upload an tracking code from llin.cz into our website? A: Hello, in a case your script does not include any variabels, you can just upload your data into HTML block in administration of your website. Code is uploaded in the global HTML block - footer area of your page. In a case that your code should include any variables, please send details description into your answer including the website page, where the code should be visible. Q: Good morning, I´m writing to you because of the problem with the warehouse status "Availability"- does not show up with some products in all language versions. A: Hello Mr. Happy, thank you for notifying us. I created a request for our programmer guys about the situation. I will contact you as soon as possible with the solution. A:1 Hello Mr. Happy, good news. There was a problem with your custom template. We fix it for product variants as well. Now it should be ok. Please, do not hesitate to contact us in a case you need a help. Q: Hello, it is not possible to change invoice numbering for 1 at the beginning - it is a new year. We deleted everything and created new but still, the numbering continues with old one. We have already 3 invoices with credit card payments, we can not change that. Please help quickly. Q: Good Morning, I´m Johny Mcdonald, and I´m working for company https://su-edif.bizwebs.mx/ and editing this online store. Specifically editing SEO tabs and optimizing a website. I would like to ask you if is it necessary to make a unique description for each product individually. I do not mean title. Or the google care about the whole website as a one piece of content? I´m just pointing to our products section- too many products in our admin section, as I can save time and generate more work in different areas. A: Hello Mr. Johny, the best case in this is that each product has the description which represents the product itself. If you have two common product descriptions, just change the detailed info in which are products different. Your "Or the google care about the whole website as a one piece of content" - Google looks at many factors (website traffic, bounce rate, keywords in your content, backlinks etc..) when ranking your website. So yes, the content is important, but not the only factor. That´s why it is necessary to improve every aspect available in your admin section as you can. With the higher organic visits, you can save your money for advertising on Google or just improve your business. Q: Hello, I would like to offer a discount voucher for a specific group of customers. These customers get an email- they are not part of the section Clients, just from my own sources. This customer will apply his / her discount voucher at the end of the ordering process. There should be a condition - Products already in the shopping cart has a minimum value. Example: client buys products over the 500 dollars (do not count payment option and delivery), insert a password "2017" and the system will apply - 10% discount for client´s order. Is it possible? It is not a gift certificate. My second question is about a discount for recent clients. We set up a discount for our clients already. I understood that the discount is calculated by itself. What has the client insert/fill in to apply this discount? Just to use the same email address which already created before and then the system pairs the data? The second question. Before the client finishes an order, he should be login to his account. Otherwise, the discount won´t be valid. Final amount of a discount is based on the DISCOUNT settings and group where the user is assigned. Check the section SETTINGS / Orders / Discount for orders in the admin section of your website for details. Yes, the email address is important, as the user = client has to be log in. A: Hello Monica, the cause of the problem was in wrong status settings. In admin section SETTINGS / Warehouses / Statuses was no check mark button in the field "In stock". System was not able to filter the right products. Please, check this field in all statuses which you would like to filter. Hope you found at least one interesting idea that makes your work easier. Because we are trying to create a powerful system made for humans. And we would love to share this idea with you. Any questions? Just start discussion down bellow and someone from BizWebs team will answer immediately. See you on February 26th again!